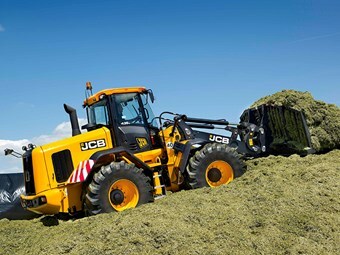 JCB has added three new telehandlers to its range of agricultural machines — the 560-80 AGRI Plus Loadall, the 435S Wheel Loading Shovel and the 536-70S T4i LP low-profile telescopic handler. The JCB 435S Wheel Loading Shovel. The 560-80 AGRI Plus Loadall is JCB’s highest capacity AGRI Loadall, with a maximum lift capacity of 6 tonnes designed for bulk re-handling. This machine features JCB’s new Auto Smoothride System (SRS), which the company says improves load retention on uneven fields. It engages as soon as the machine moves faster than 4km/h. "The SRS activates through a combination of a dry nitrogen and oil filled accumulator installed in line with the loader lift cylinders," JCB Construction Equipment Australia (CEA) national product manager Greg Sealey says. "When activated, the SRS allows the loader arm to float, counteracting variations in road or site surfaces and providing a smooth ride for the operator and maximising load retention." Regarding the JCB 435S Wheel Loading Shovel, Sealey says it has been designed with a massive power to weight ratio, enhanced traction and fast travel speed, while remaining cleaner, quieter and more efficient than other models on the market. The 435S is powered by a 6.7-litre, six-cylinder Cummins QSB engine which produces 230 horsepower (171.5kW), with a peak engine torque of 945Nm at only 1500rpm for excellent response. "The torque convertor lock provides closer gear ratios for better acceleration, hill climbing and road performance, reaching a top road speed of 48km/h," Sealey says. "This, coupled with high-performance twin hydraulic pumps, gives fast and efficient attachment and machine operation." Turning to the 536-70S T4i LP Low Profile telehandler, Sealey says JCB has seen an increase in demand for low-profile telehandlers that also boast high capacity. "The 536-70S T4i features all of the updates from the Agri Loadall range, but in a lower profile cab, which is perfect for poultry and livestock farms," he says. A new regenerative hydraulic system on lower and retract functions has allowed for improvements in efficiency by reducing fuel consumption and productivity through faster cycle times, he adds. "The hydraulic system allows for increased efficiency through reduced fuel consumption and controllability through better metering and reduced pressure when required to lower and retract. "We are seeing productivity increased by over 19 percent with the 536-70S T4i," Sealey says. "Most notably the boom is lowering at low idle in over half the time than the previous non-generative machines." All three machines are fitted as a standard with JCB’s Livelink fleet monitoring system, which delivers real-time information on fleet management, maintenance, run hours, and security to a computer, tablet or smartphone.